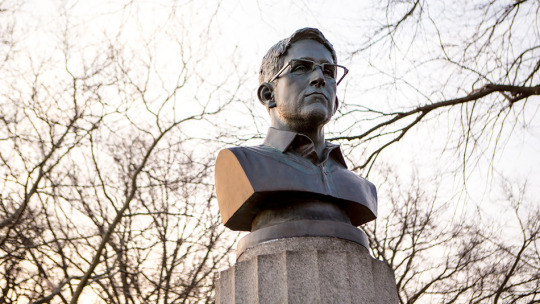 Last week, three anonymous artists put up a statue of Edward Snowden in a public park in Brooklyn. They crafted this bronze bust as ‘a gift to the city’, a memorial meant to spark conversations about issues central to our freedom. But this morning, free speech advocates in NYC held a press conference to demand the confiscated Snowden bust be returned to the artists. Sign the petition joining the call for the NYPD to return the Snowden statue. A local gallery has already agreed to exhibit the work while the artists submit an application to legally install the sculpture through the New York City Parks Department. In other words, New York could soon have a permanent monument to the whistleblower who challenged NSA surveillance. But first we need to free the statue! Snowden may still be in exile for exposing the NSA’s crimes, but we can honor his efforts to hold the US government accountable by making sure this artwork gets released. Sign the petition now, and share it widely! P.S. Want to make sure the NYPD hears you? Click here to tweet at the NYPD Commissioner or call the Commissioner’s direct line for public interest inquiries: (646) 610-6700.